Stretch limos for hire. Chrysler limos, Hummer limo, pink limos, party buses and more! Cars for Stars are proud to present our award winning fleet of state of the art limousines. Whatever style, size, or colour stretch limo you may be searching for, youre bound to find just the right limousine to suit your requirements when you browse our extensive limo gallery. If youre looking for an elegant limousine, maybe to transport you to an upcoming special occasion such as a corporate event, day at the races, wedding or birthday party, then the Baby Bentley limo, also known as the Chrysler limousine, might be just up your street. This imposing limousine has a powerful presence and never fails to turn heads wherever it goes. Many of our deluxe Chrysler limousines are fully equipped with onboard champagne bars and also a range of entertainment features so our clients can rest assured theyll receive a superior standard of travel when they hire the Baby Bentley limo. 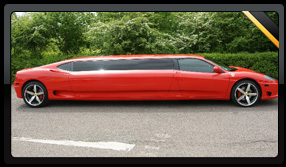 For those who really like to stand out from the crowd, take a look at our exclusive Ferrari limo. This luxurious limousine is the only one of its kind in the world and not surprisingly, its highly sought after for events taking place throughout the UK. 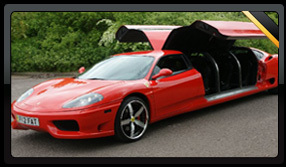 Whether you want a limo with the wow factor for an important corporate event or product launch, or if you need an attention grabbing limo for your school prom, the Ferrari limo is the perfect choice of limousine hire. Our jeep limos and 4x4 limousines are always in high demand for a whole host of occasions. The Audi Q7 limousine is a high class jeep limo fully equipped with top onboard features including champagne bars and luxury leather upholstery, while the Range Rover Jeep limo is another popular choice for corporate functions as well as special events such as hen and stag parties, birthdays and school proms. All of our luxury stretch limos are driven by smart, fully suited and courteous chauffeurs who will go above and beyond the call of duty to ensure your limo hire experience with Cars for Stars is nothing short of perfect. Please browse our stunning selection of immaculately maintained limousines now and find your ideal vehicle for an upcoming event. To get a quote please call us on 0845 500 3030. Limousine Hire. View our limousines available for hire from Cars For Stars. From classic limos to Hummer limos to pink limos. Choose your ideal limo at Cars for Star.